At source, energy is flowing from the Sun. Vast quantities of photons are ejected from its surface every second and some carry their energy to Earth to, in large part, animate its activity. Our interest here is to discover what happens next, when this energy reaches our planet and enters its terrestrial environment. Upon arrival this solar energy flows through a number of “sub-systems” that combine and connect to create an ecosystem which, in a metaphorical sense, appears as a Great Global Refinery. Business, with its inherent components of innovation and production, together with the workers and consumers that combine to form an economy, comprise a series of linked sub-systems of this Great Global Refinery as shown on the graphic below. As this is one very large interconnected network, we might enter into its lumen at any point, and a rain shower is as good as any to begin to explore the plumbing. The water cycle is often described as “evaporation, transpiration, condensation, precipitation, run-off”. The Sun heats the waters of an ocean. The solar energy beamed down onto the ocean surface agitates water molecules to an extent that some are able to cross an energy barrier presented by the ocean surface and begin an airborne journey. Thermal effects cause the moist air to rise as the potential energy of the heavier, colder air displaces the warm vapours to higher altitudes, until they reach an equilibrium height in clouds. 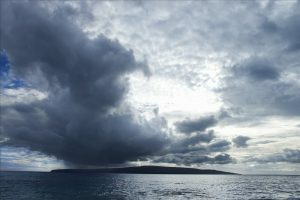 The prevailing winds blow the clouds over the seascape to reach and then rise onto the higher landmass. The moisture of a slate grey cloudscape condenses into drops of rain. As this rain falls the potential energy gained when the Sun earlier had heated the ocean surface is transformed into a kinetic energy in the falling droplets. In isolation this energy is miniscule, but as the raindrops collect in channels to form rivulets and streams they combine their energies to become an appreciable erosive force. As the rain engorged streams cascade down mountainous slopes, some potential energy in the water will be dissipated in creating the micro-fractures of erosion, through which steep river valleys are eventually formed. 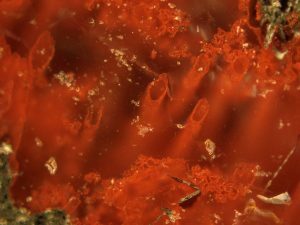 Haematite tubes from the hydrothermal vent deposits in Quebec, Canada that represent the oldest microfossils and evidence for life on Earth. The remains are at least 3,770 million years old. Credit: Matthew Dodd, UCL. And so it was for millennia that rivers formed a terrestrial channel for energy flow. Then a new form of conduit emerged to process more of the vast energy resource that showered down upon the early Earth. About four billion years ago biology was born. Soon thereafter solar energy began to be captured by the photosynthetic activity of stromatolites, in the early days of the evolution of plants through which this energy is initially captured to flow into the food chain. Energy is passed from vegetable to animal, from prey to predator. The energy is deposited by a fallen leaf onto the soil, into bacteria and on into further tributaries of the food chain. The energy each biological organism receives through food enables it to sustain itself to the search for more food and to reproduce. A subsequent new domain then emerged to enhance further the energy processing potential of the Great Global Refinery – intelligence and its adoption to create an economic society. Tapping into the energy conduit that formed our earlier mountainous cascade, an intelligent agent is able to develop another system through which energy is able to flow. The potential energy and kinetic energy of the torrents that race down the steep hillsides can be harvested and deployed elsewhere. A Highland Electricity Company elects to obstruct a particularly fast-flowing river with a hydroelectric dam and directs the water flow through its turbines. 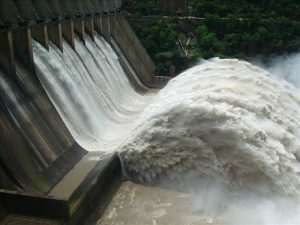 A huge reservoir of water with an equally enormous potential energy builds up behind the dam, but this energy is insufficient to breach the mechanical strength of the obstacle – the dam holds firm. The energy that once propelled the water through turbulent streams is now controlled and set for harvesting. 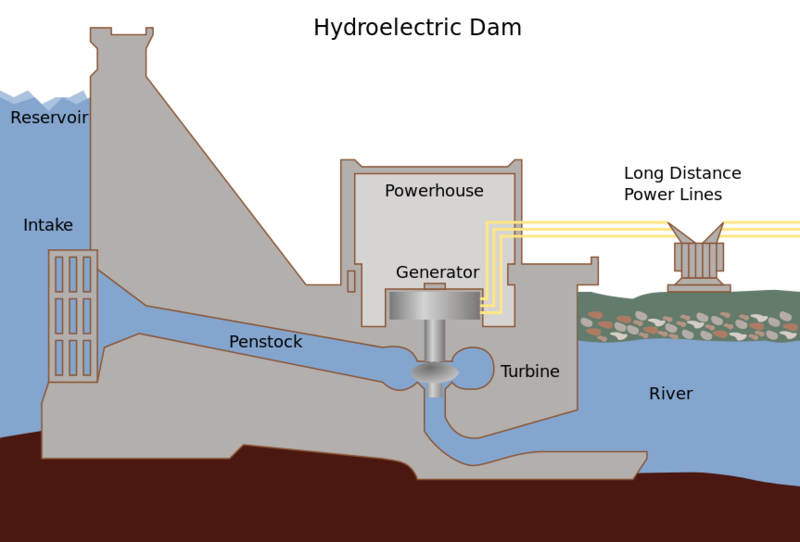 As water pours through the turbine channels, the blades are rotated and generators convert some of the energy carried by the water into an electric potential. The water leaves slightly subdued, stripped of a portion of its intrinsic vitality. As the river’s remaining energy takes the water to the sea, an electrical energy now flows through a different channel, along high-tension cables to power a society. This conduit is also filled with an energy obtained from the combustion of fossil fuels. That energy also came from the Sun and fell onto primordial forests in an earlier epoch from which the chemical energy of the oil and gas and coal has now found the freedom to flow once again through the electrical and thermal conduits of a modern society. Electricity (and other forms of energy) is consumed by an enterprise in the production of its goods and services. 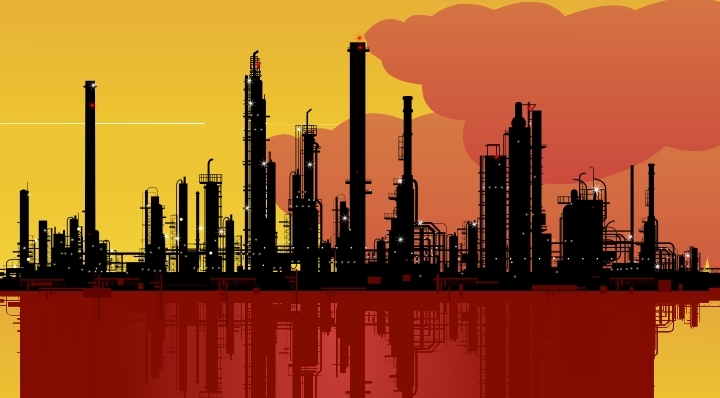 Supply chains and distribution conduits similarly connect with the integrated sub-systems of the Great Global Refinery in which materials, manpower and machines combine their energies in production operations. Innovation plays an essential role in the enterprise operations, which later we will interpret as a conversion of energy into a potential associated with the creation of value in the produced goods or services. Through the motorways, main roads and side roads of an economy, workers arrive at their place of work. The products of their labour are carried along these same road networks to distribution agents to be made available to a geographically distributed consumer population. The citizens of an economic society make up both the workers and the consumers. They purchase food and shelter to satisfy their essential requirements for sustenance, as their animal heritage dictates. They will also consume manufactured goods or fuel energy itself, as their society dictates, all of which proceed to contribute to an energy flow through the conduit that is their individual life. Every moment of one’s existence is supported by the energy that passes through a conduit which is oneself. Every activity is a processing of this received (or purchased) energy and an end of life is marked by a cessation of this energy throughput. The energy that flows through the conduit which is an enterprise similarly enables it to survive, just as the potential energy of the water flowing through the hydroelectric turbines enables the Highland Electricity Company to operate. Imagine what would happen if these energy flows were to stop, if the rainfall ceased and the river ran dry. The turbines would then cease to rotate, sales would stop, income would fall and investors would pull out. In short, the company would die. Maybe this demise would not be immediate as additional survival investment may provide the financial equivalent of a life-support machine. But eventually, without a turnaround in fortune, it would be necessary to throw the switch. A hydroelectric dam is essentially a tube and its function, vitality and its life are dependent on a flow of energy through its tubular lumen. Similarly, the Highland Electricity Company itself is no less of a conduit for the flow of energy and without this flow the company will cease to exist. And so indeed it is so for all the component parts of our Great Global Refinery. Should any branches, flanges, tubes and valves be devoid of their essential energy flow, then they will become superfluous and atrophy as naturally and automatically as they were created. As it is with organisms, so it is with companies, hydroelectric dams and rivers. It is all fundamentally a matter of energy flowing through tubes, the principle difference being the energy transformations that occur during its passage. The essential role of solar energy has been recognised at various points in the history of mankind. Early in this history the Sun was deified or at least engaged within spiritual beliefs of communities as bringing not only light but also beneficence, justice and wisdom, by expelling darkness, ignorance and disease. This solar mythology arose in the figures of Kheper and Re in Egypt, Utu from Sumeria, Vivahvany from Iran, Surya from India, Tezcatlipoca in Aztec South America, Inti of Peru and Amaterasu in Japan. On 25th December, the Roman feast of Sol Invictus, the Feast of the Unconquered Sun, was a joyous celebration adopted by the Christians as the birthday of Jesus Christ. In 18th century France, in the early economics of the Physiocrats, it was the Sun through agricultural production that was at the origin of wealth creation. These ideas had a profound influence on the great Scottish classical economist Adam Smith as he had the opportunity to engage with them in Paris around 1765. But more on this later ….. While a river valley unquestionably can be seen to guide the flow of the water, it is the river itself that has etched a path which is not at all random. Its meandering direction is governed by the laws of physics. Thus, we can say it is the flow of energy in the water that has produced the conduit for itself to flow. Just as the Earth was displaced as the centre of the universe with the heliocentric model of Copernicus in the late 16th century, placing the Sun at the centre of rotation of the planets, it is possible to displace the anthropocentric manner humans recognise energetic forms and catalogue these as they appear in their world. Above we have taken the conventional approach in explaining how the transformation of solar energy through the food chain can supply human activities such as labour. 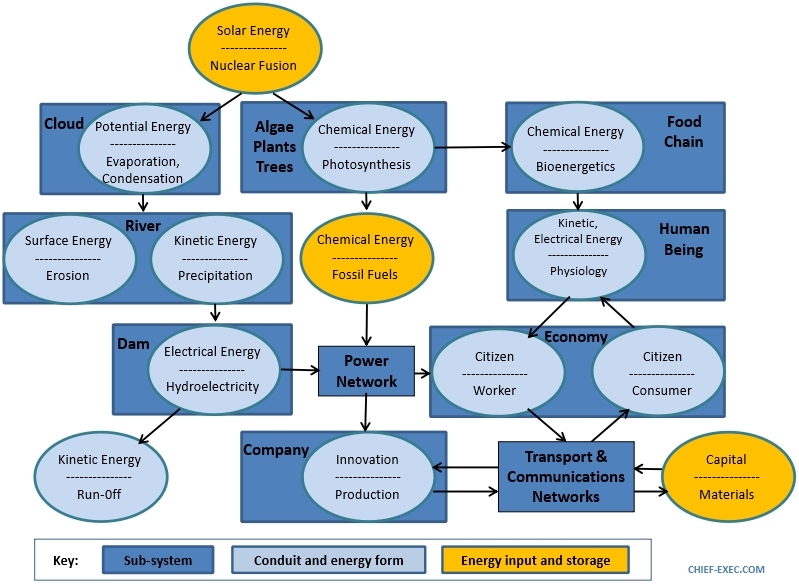 We can recognise human labour and commercial enterprise as activities that are powered by the energy received, but can this sequence of cause and effect be interpreted in reverse, with energy driving the creation of an economy with its factories, roads and finances, to provide new conduits through which this same energy might flow? More generally, this is a view of the world as a refinery that has assembled itself to connect all the features within our terrestrial system into one enormous energy processing plant. And the driver for this gargantuan engineering enterprise is the energy that is continually shaping the conduits through which it passes. This single interconnected and huge apparatus of which we are part we have called the Great Global Refinery. Next we will explore how energy shapes the nature of the economic transactions that occur within its commercial conduits. To simplify the Great Global Refinery graphic, several sources of non-solar energy have been omitted, the most significant of which are nuclear and geothermal energy. Wind power and power from solar cells are derived from solar energy harvested though different mechanisms that are not shown. Tidal power is derived from the gravitational pull of the Sun and moon and is also not considered. The Physiocrat theory of wealth creation was intended to compete with the then prevailing mercantilist belief that wealth was proportionate to the amount of gold in one’s possession. Notably by the Principle of Least Action. Be the first to comment on "The Great Global Refinery"